I've posted twice about how to cook an old chicken, but in the two and a half years since then, my recipes have gained sophistication. 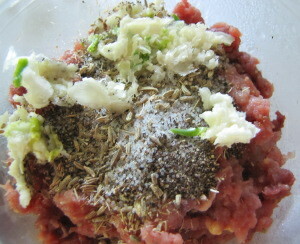 When it came time to cook our mean rooster, I earmarked most of his flesh for pizza sausage (aka Italian sausage.) I used to think that making my own sausage sounded scary, but lately I've decided that it's actually one of the easiest ways of dressing up tough meat. If you plan to use the sausage in pizza, spaghetti sauce, or gravy, there's not even any need to mess with casings or to worry about fat to protein content. You can't really go wrong. Next, crush the fennel seeds. If you own a mortar and pestle, I'm sure this is a breeze, but it's not that tough even without one. 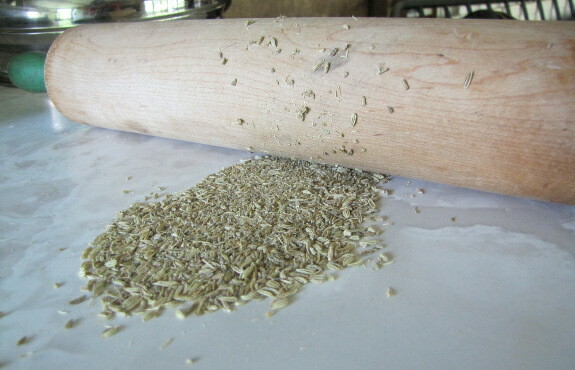 I pour out the seeds onto a large cookie sheet or a clean counter and roll over them repeatedly with the rolling pin. You'll need to keep pushing the uncrushed seeds into the center of the pile with your hand until they're all crushed, so this might take two or three minutes. Some folks put the seeds in a ziploc bag before crushing to make the process even simpler, but then you have to throw the bag away. 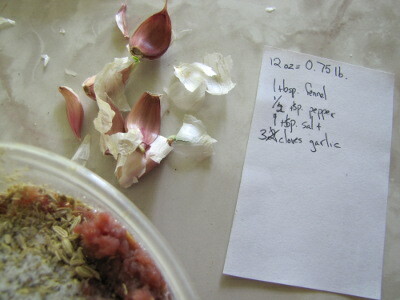 Pour the crushed fennel seeds into the ground meat along with the pepper, salt, and pressed garlic cloves, mix well, and refrigerate for at least four hours. This time is necessary to allow the flavors to work their way into the meat. When you're ready to use your sausage, fry it up in a skillet on medium to high heat, stirring often and crushing the clusters with a fork so the sausage doesn't clump up. You might find a few more threads of connective tissue that you missed --- pick them out. 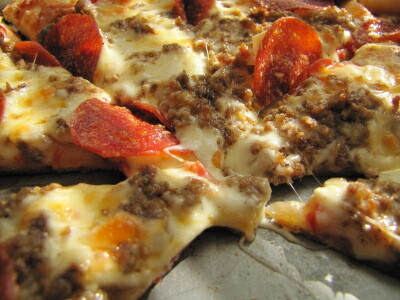 Then spread the pre-cooked meat onto a homemade pizza and bake. We stewed up the bones (and residual flesh) into a simple chicken soup and then used the rest of the flesh in the recipe above. The sausage is a bit too much for two pizzas, so I have enough left over to add into some homegrown omelets. All told, I figure our old rooster served as the main course for a full fourteen people-meals. That's not bad! Our chicken waterer kept our rooster healthy so that his flesh was delicious and nutritious. I've tried several variations of sausage on a pizza over the years and I have to say this is by far the tastiest yet. I have made a lot of homemade pizza, but haven't ever tried homemade sausage. This looks really easy and tasty too! I'll have to get some fennel and try it out. Mark --- Thanks for saying that! I didn't realize the sausage had passed the test with such flying colors. 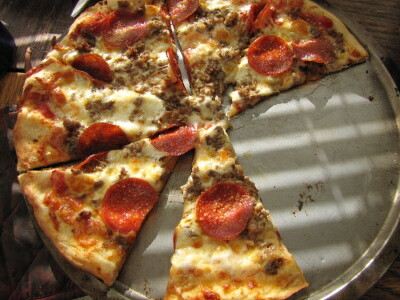 This certainly looks wonderfully tasty to me, and since my husband's favorite pizza topping is sausage, I think I'll have to give it a try too - thank you for sharing! On a side note, I've tried that whole "putting things in a zip-loc bag and rolling over them" method, and all I ever got out of it was a very moth-eaten bag and a paranoia about eating plastic. I definitely like your method or a nice mortar and pestle better! I'm glad I'm not the only one who finds the bag method distressing. 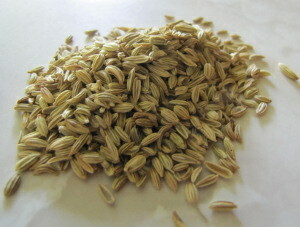 Luckily, this alternative works very well, at least for fennel seeds! I was wondering if you start with cooked chicken when making the sausage?? It wasnt really clear to me if the chicken you used to grind was raw or cooked? I am not an experienced cook so sorry if this question seems odd. Thanks! That's an excellent question --- I should have been clearer. You always want to start with raw meat when making something like sausage since the raw meat seems to merge with the flavors better. made your sausage this morning with deer meat scraps from last year and I want to thank you for sharing it is wonderful. I made it and fried before putting it on the pizza . it is outstanding and SO GOOD I think you spoiled me and now no more store meat for me. my family thanks you they will get meat on their pizza tonight. Blessings.